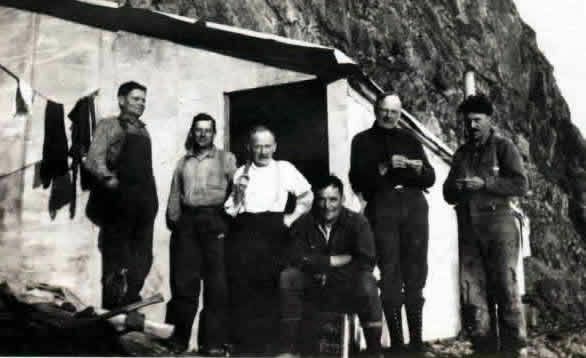 Ike Thompson made the first location on Glacier Creek; the Hallie, on the ground just above the forks. Ike used to like to tell the story on how he made the find, which resulted from his adherence to the principal that he maintained while prospecting. This was to “break everything” and to never pass likely looking rock without doing so. He was on his way up the south fork, and in climbing a steep bank he saw an outcrop of rock some distance away. It being somewhat difficult to reach without going out of his way, he, kept on, and as he traveled he kept saying to himself, “Well you didn’t break that one.” Although he had gone quite a distance, he forced himself to return and break the rock, which was almost solid galena. This claim, with several others, was acquired by the Albany Mining Co. Ltd.
Thompson had induced others to follow. Dodge and Gourley went farther up the creek and located the Jumbo and other claims at the headwaters. The claims were located on a wide belt of mineralized quartz-to some places over 100 feet wide-which was extensively developed by the Pacific Coast Exploration Company from 1910 to 1912, and five tunnels driven with about 1,000 feet of underground work. The property is now owned by Ben Bolt Mining Co. Ltd.
Sam Gourley was a great joker and his partner, Jack Dodge, was similarly inclined, and throughout their partnership they played many tricks upon one another. One of these was to tell people in confidence impossible tales of the others doings. Rather than deny them and make the partner a liar, those stories were accepted as truth by Dodge and Gourley. Sam had rather the best of it, and Dodge schemed to put one over on him. This he did by telling Rainey and his wife, who was spending that summer here, that Gourley was an educated man, a college graduate and a fully ordained clergyman who had a church of his own and was quite a preacher, but he had decided to be a prospector instead and did not want anyone to know of his former occupation. Gourley was quite a friend of the Raineys, and used to visit them when in town from the hills. In due course he learned what Dodge had said about him; but according to the game they played with one another he could not deny it, and afterward was known as “Rev” Sam Gourley.